Beware of this specific thought!! Caution. Caution. In fact, I urge you to envision yellow caution tape (like you see around a dangerous construction zone) every time this thought comes into your mind. The thought is “I deserve a different husband”. That is a thought emanating straight from the pit of hell. When Satan dangles that thought in front of your mind, he’s basically trying to entice you into believing that you have been ripped off and that you are entitled to trade in your man for a better model. I should know. I bought that lie from the enemy, hook, line, and sinker at the end of my first marriage. You know who else fell for this kind of thinking? Eve. She fell for Satan’s lie that God was ripping her off by withholding fruit from one of the trees and he got her to believe she was entitled to more than God had given her. That story didn’t end well either. 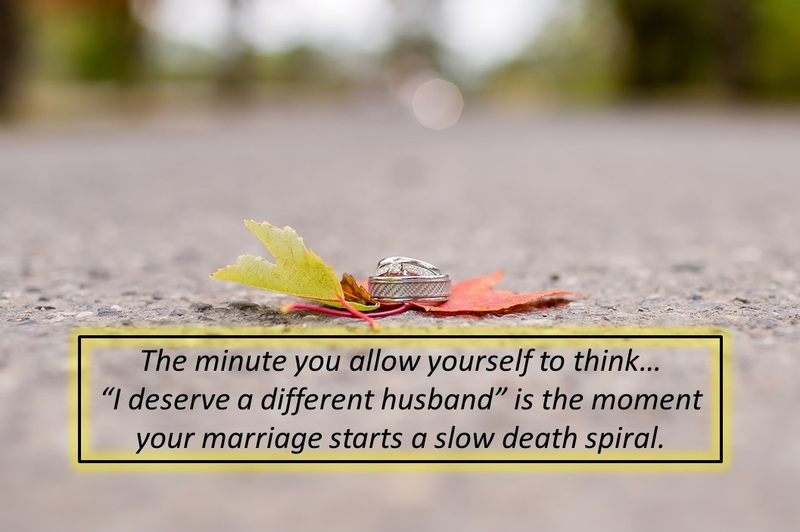 Not only is it a lie that you deserve a different husband…it’s also a delusion from Satan. I can almost guarantee you that if you were to dump your husband and get a new one, he would have “issues” as well! So don’t fall for Satan’s schemes and delusions. Remember what the Bible tells us in 2 Corinthians 11:14…”Satan masquerades as an angel of light”. So, instead of buying the lie that you need to dump your inferior man and get a better model, how about if you do these three things instead? 1) Look for the good qualities of your man and be thankful 2) Respectfully confront any sinful pattern of behavior on his part 3) pray daily for Jesus to mold and shape your husband into a godly man of integrity.